On the day a girl who died in a hike in the San Gabriel mountains was remembered at a memorial service, two women had to be rescued after falling on the same trail. Rescue crews worked on Saturday to rescue the women on the Eaton Canyon trail. 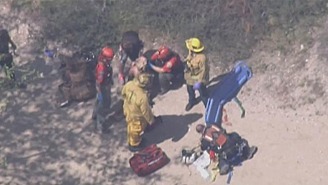 A woman was wounded during a hike on an Eaton Canyon trail on Saturday, March 30, 2013. In this file photo, rescue crews tend to wounded hikers on Friday, March 22, 2013 on the same trail, which is in the foothills of the San Gabriel Mountains, in Pasadena. One woman in her 40s fell at the first waterfall at Eaton Canyon Park, said Lisa Derderian, a spokeswoman with the Pasadena Fire Department. She had a minor nose injury and felt dizzy, so search and rescue crews called in a helicopter to hoist her out. At same time, a call came in of a woman in her 20s who hurt her ankle closer to the Nature Center and parking lot. The trail was full on Saturday with hundreds of hikers during Easter Weekend. The news comes after the death at the trail of Esther Suen on March 22 and a public safety message by police and fire agencies warning about the trails dangers. Bernard Spencer, of the Los Angeles County Fire Department, said firefighters are dispatched to the trail up to 20 times a month. “For us, it’s a normal thing to go out there,” he said. Suen was with several other friends on a spring break hike when she died. An 18-year-old man who was with her was injured. #SMEM Social Media Emergency Management News Alerts from police, fire and emergency management agencies will appear on Google maps and search pages beginning Friday as part of a growing Google public alert system. Google has partnered with Nixle, a company that contracts with public safety agencies to send alerts via cellphones and social media. Police and sheriff's departments in Chicago, Dallas and Los Angeles are among agencies using the service. The alerts will appear when someone uses Google in an area with an active alert or searches for a place that has an active alert. There are 6,500 police agencies that use Nixle. Those agencies serve more than 150 million people, but of that potential audience, only 2 million people subscribe to alerts, Nixle CEO Eric Liu says. "It's not on a person's mind until you're in a crisis situation," Liu says. Working with Google, he says, will "change the equation." Google says it has 100 billion searches per month. "That's just a mind-boggling number," Liu says. "It will empower local police to access that base in the interest of public safety." Access to Google's vast audience will help police send warnings, traffic reports, school lockdowns, missing children bulletins and other public safety alerts to more people, says Capt. Mike Parker, spokesman for the Los Angeles County Sheriff's Department. LASD signed up for the free Nixle service — there's also a paid premium version — three years ago, Parker says. Although the department posts information on its website, Twitter and Facebook, not all residents use social media or have smartphones, he says. About 30,000 people in a county of more than 10 million now subscribe to the department's Nixle alert system, he says. The link to Google "is going to have a huge impact," Parker says. "We're going to get more information to more people sooner." The new partnership expands Google's year-old alert system, which began Jan. 25, 2012, with warnings issued by the National Weather Service, the U.S. Geological Survey and the National Oceanic and Atmospheric Administration appearing on Google Maps, Google communications manager Kate Parker says. Google has since added the Japan Meteorological Agency and AMBER alerts for missing children. Nixle adds "hyper-local" police information, she says. During Hurricane Sandy, which struck the East Coast in October, Google posted public alerts including evacuation routes, lists of shelters and other emergency information, Parker says. "Increasingly," Parker says, "people are turning to the Internet when a disaster happens." Learning Objective: The student shall be able to identify the five required steps to establish a Community Arson Watch program. A neighborhood’s arson problem can range from youngsters setting nuisance fires to a full blown crisis with a serial arsonist. Following the successful Neighborhood Watch five-step program model provides an effective groundwork. Step 1 - The first step is to analyze the specific local problem and collect related data. Strategies that address the problems in a given area must be mapped out. From the outset, it is essential that neighbors work together. This effort provides an opportunity for neighbors to meet and get to know each other, something that has become less common lately. It is crucial to include neighborhood involvement for the process to be successful. In addition to not being familiar with your neighbors, the dilemma is compounded by the fact that many adults in these neighborhoods work multiple jobs frequently with odd hours, making it extraordinarily difficult to schedule meetings and organize events. 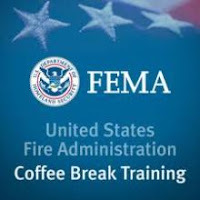 Step 2 - Once the neighbors have a connection, the second step involves building a partnership between fire and emergency services, the police and other law enforcement agencies, and the residents. This is often the most difficult step to hurdle because there is usually angst between the residents and law enforcement for the existing crime problem that exists in their community. Step 3 - The third step is to assess the needs of a given neighborhood and in the case of arson, how the fire and police departments can work with the residents. Neighborhood Watch states, “In many cases, law enforcement and community members do not have the same focus. An effective Neighborhood Arson Watch program will combine the needs of the fire and police departments with those of the neighborhood when determining which problems to focus on and the methods used to address them. Step 4 - The penultimate step in setting up a Neighborhood Watch program is choosing and training a dynamic group of volunteers that are led by organized and motivated leaders. If the group leaders are devoid of motivation and organization, the volunteers may be uninspired to participate and quickly quit out of disappointment and frustration. Step 5 - The fifth and final step is to develop meaningful projects specific to the identified problem. Often, after a Neighborhood Watch has addressed its original issue, members lose interest. It is important for leaders to remain passionate. One way to accomplish this is to design new projects so that there is always a goal towards which the team of volunteers is aspiring. Learning Objective: The student shall be able to identify required steps community residents can take to safeguard their homes from arson. Arson robs communities of its valuable assets — lives and property. It destroys more than buildings: arson can devastate a community resulting in the decline of the neighborhood through increased insurance premiums, loss of business revenue and a decrease in property values. Every year more than 25,000 intentionally set fires in homes result in an estimated 300 deaths, 700 injuries and $500 million in direct property damage. The average dollar loss for an intentionally set fire in a residential building is $21,320. The fatality rate for intentionally set residential fires is more than twice that of other residential building fires. The fire service can help communities thwart the occurrence of arson and reduce its devastating effect by making residents aware of these measures to safeguard their homes. Install lights covering all sides of the house. Motion-activated lighting, which is inexpensive, should be placed near the entrances. Interior lights on timers give the illusion a residence is occupied. Alarm devices can be inexpensively wired to transmit an alarm to the police or fire department. Check the cost of contracting with a security firm for response to alarms. Make sure that nothing blocks the view of the house. During the growing season, bushes and trees may need to be trimmed frequently. All external doors should be equipped with dead bolts. A simple locked door could be the deterrent that saves a house from arson. The hardware used to lock windows can sometimes be easily forced open with a credit card or other tool. The best type of window hardware has spring-loaded bolts that insert through the window frame into the wall frame. Oftentimes, arson is a crime of opportunity. Remove excess vegetation and piles of leaves. Clean around your house and garage, removing unused and unneeded paper, trash, cleaning supplies, partial cans of paint and other materials that could become kindling and fuel a fire for an arsonist. The combination of working smoke alarms and home fire sprinklers reduces the likelihood of death from fire by more than 82 percent. The most effective fire loss prevention and reduction measure for both life and property is the installation and maintenance of fire sprinklers. Learn about the five required steps to establish a Community Arson Watch program. (See Coffee Break No. FM-2011-0.) Form a neighborhood program, and publicize your community’s efforts. Arsonists seldom strike when you are ready for them. The California Board of Forestry and CalFire has released a proposal to target about 38 million acres (1/3rd of the entire state) to be burned, chewed-up, or sprayed with herbicides. This increases its habitat clearance program five times over current levels in what the California Chaparral Institute (CCI) calls a “major threat” to wildlife. If approved, the proposal will exempt individual clearance projects from the citizen and independent scientific oversight that is currently required under the California Environmental Quality Act (CEQA). The comment period has now been extended to April 8, after originally closing February 25. East County Magazine was not notified of this proposal by Cal Fire, despite the fact that we are on Cal Fire’s media notification list and operate the Viejas Wildfire & Emergency Alert service. East County Magazine editor Miriam Raftery asked Cal Fire to reopen the comment period be reopened because of the failure to notify ECM, which has 150,000 readers a month in the most fire-prone regions of San Diego’s East County. ECM operates the Viejas Wildfire & Emergency Alerts service and is on the media notification list for state and local Cal Fire news releases. We are pleased to announce that the comment period has been extended to April 8. View the Cal Fire proposal here. We are waiting to hear back from the Board of Forestry. To stay up to date on this matter please go to CCI’s CONTACT page and sign up for an email list. You can sign a petition here. 1. We Requested the Board of Forestry to retract the Vegetation Treatment Program Program EIR (Environmental Impact Report) and create a program that will properly consider the entire fire environment, reflect regional differences, allow for independent oversight, and incorporate the most up to date science. PORTSMOUTH, Va. — The United States Coast Guard is standing down their response to a vessel with nine people aboard approximately 500 miles southeast of Bermuda, Wednesday. Coast Guard 5th District watchstanders initially received an emergency position-indicating radio beacon distress signal at 1:15 p.m. registered to the 109-foot catamaran, Mouse Trap. The Mouse Trap’s crew had made contact with Rescue Coordination Center Gris Nez, France and reported that their vessel was in distress after losing their mast, and that one crew member was deceased. At approximately 4 p.m., watchstanders received notification from the International Emergency Rescue Coordination Center reporting that the Mouse Trap's crew were no longer in distress, had been able to get their engine started, and were currently en route to the Cayman islands. 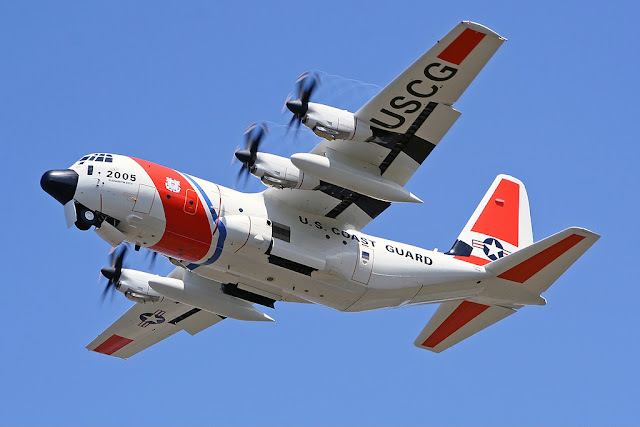 An air crew from Coast Guard Air Station Elizabeth City aboard an HC-130 Hercules aircraft has returned to base while the two AMVER vessels have resumed their original courses. SAN FRANCISCO (KGO) -- A fast-moving fire forced people to run for their lives in the middle of the night Wednesday in San Francisco's Bayview District. It spread quickly to neighboring buildings, injured firefighters, and displaced nearly two dozen people. Investigators say the fire, which caused millions of dollars in damage, could have been a malicious act. Firefighters admit it isn't a strong lead but they are following up after questioning someone who heard from someone else that they saw something. The fire was aggressive. It traveled to three neighboring buildings before fire crews could get to the scene. People sleeping inside the building woke up feeling a mixture of fear and shock. "Oh my gosh, wow," Patricia Lunn said. "It was so big I could see it going billowing over to my window and it was just wow, humongous." The fire caused significant damage to three buildings. Water from the firefighters' hoses flooded the first floor of two other buildings. Fire officials determined that the fire started in between two buildings on McKinnon Street at Third Street just before 1 a.m.
"There were 20 citizens displaced by this fire. American Red Cross has been working with the displaced residents," said SFFD Battalion Chief Tom Abbott. "I've very upset about it. That's my baby and it's no longer existing so, we're going to try to maybe, possibly, put it back together," said Clarence Williams who owns the three buildings that were burned. As of 11 a.m. Wednesday, firefighters hadn't allowed Williams to enter the buildings due to concerns the structure could collapse so he couldn't say how badly the buildings were damaged, but he suspects they are a total loss. Everyone got out safely but Williams is still worried about his tenants. "I'm relieved they're OK but I'm sorry they don't have a place to stay," he said. "After three days, Red Cross will no longer house them. So, where are we going to go from there?" Two firefighters suffered minor injuries during the incident. The Scary Part: The Company Touts Further Uses Such As Biological Warfare And Weather Modification! 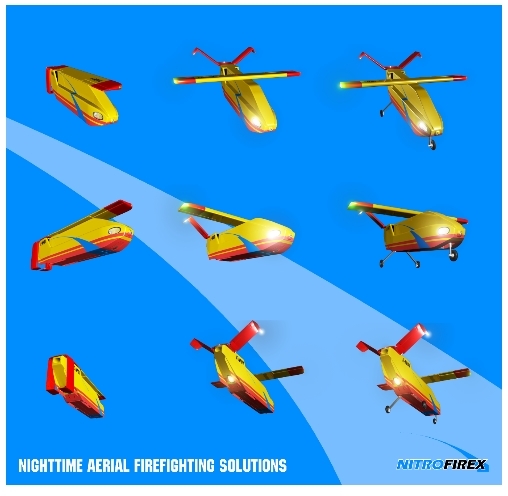 A Spanish company NITROFIREX proposes a fleet of combat aircraft capable of nighttime wildfire firefighting launched from a mother-ship over a wildfire at night. Besides the seemingly insurmountable problems and doubtful effectiveness the company is vying for government contracts. 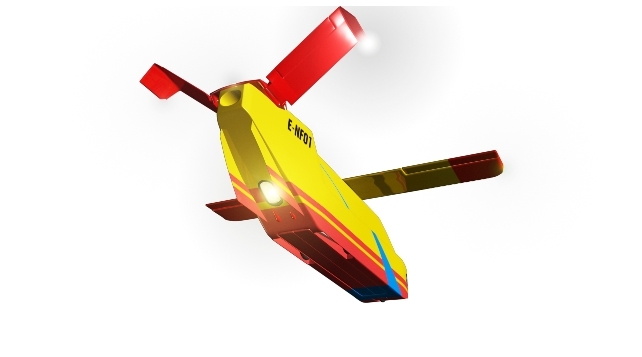 As reported by the company to Europa Press, the prototype unmanned NITROFIREX, which is currently under design, will bring "unique capabilities in the world" as far air assets dedicated to the work of firefighting.leveraging the current technological development of unmanned systems. Specifically, the project consists of unmanned glider containing the extinguishing agent and after being fired from the rear ramp of heavy transport aircraft to autonomously target source of fire to discharge its contents with great precision and flight and recovery to a airbase. These APGCâ€™s, containing a beneficial cargo, are capable of gliding (with engine at iddle position) and are equipped with a guiding system directing them automatically to the point of discharge. Transition from APGC into UAV. On reaching their target the APGCâ€™s drop their load automatically and with great precision. Then, by taking advantage of this important and sudden loss of weight, they climb rapidly and escape from the hostile zone. This manoeuvre is used as a transition for the following phase of recovery. The fire broke out inside a classroom at Farmdale Elementary School on Winder and La Mesa. The three suspects authorities were looking for are younger than they anticipated. Two of them are 14, and one of them, a 10-year-old boy and a current student at the school. Lt. Tom Trindad said, "They went inside and threw some graffiti up on the walls using paint that was in the classroom and of course they set a fire inside of it." Firefighters were alerted to the flames when a burglary alarm went off around 1:30 in the morning, followed by a fire alarm. Merced Fire Chief Mike Mclaughlin said, "Our crews initiated fire attack and it had been burning for a moderate amount of time." The flames destroyed books and desks, water damaged nearby rooms and the incident forced the library, science and computer lab to close for the day. Farmdale Elementary School Principal Kathy Moser said, "We had one class that had to be moved and a few other intervention classes, but business is going on as normal, the kids are flexible and the teachers have been very very cooperative." Police say a security camera captured the three suspects break into the classroom, ransack it and light a small area on fire. "Fortunately there was nobody on the campus which would have made it more serious, but still the property damage of course and then you have to think of first responders that go out there," said Lt. Tom Trindad. "There are firefighters that put their life on the line to stop the spread of that fire and of course we have a big concern for them." Officials are also concerned for the students who may learn one of their classmates is accused of committing the crime at their campus. Lt. Tom Trindad added, "Kids want to feel safe at school and somebody damages or breaks into a school that makes them feel less safe." Officials are taking this very seriously. Firefighters say the fire caused $30 thousand in damages, but could've been much worse if it weren't for the sprinkler system. The two 14-year-olds were booked into juvenile hall, and the 10-year-old was released to his parents. The school says a restoration company will work through spring break to clean up the campus. UPDATE: DAYTON--Dayton Police released dash cam video showing a Dayton Fire Chief getting injured on U.S. 35.
and his body is tossed around like a rag doll. "When the car struck him, he left the ground and went about 15- 20 feet , airborne." Dayton Fire Chief Herbert Redden said. Captain Cron has serious injuries, but is thankfully is going to be okay. "The drivers hit the ice and lost control of their vehicles." Chief Redden said. when you see flashing lights along side any roadway. "With any emergency vehicles with lights blinking should automatically tell you to slow down back off the accelerator go to a crawl speed until you have knowledge of what is going on." Chief Redden said Cron has been with the Dayton Fire Department since 1992, and was promoted to Captain in November of last year. "He goes out of his way for other individuals whether he's on duty or off duty. He is what you would call the creme of the crop." DAYTON -- Dayton Fire Capt. Barry Cron is in serious condition today after a spectacular series of crashes early this morning on a bridge along U.S. 35 near Gettysburg Avenue. Dash cam video, provided by the Dayton Police Department, shows a pickup truck crash into another vehicle that had already crashed. Cron approached the truck, which ended up overturned on its passenger side, when another first responder yelled at him to get back because of another vehicle that had lost control and was about to hit the truck. than 50 pints of blood. You can help out the cause by joining us and donating as well. If you want to signup visit www.redcrossblood.org and click on the Schedule a Donation Appointment link and use the code ocfire, in the sponsor code, to find our event. For more information about the OCFA, call (714) 573-6200. CAL FIRE Riverside Unit and Riverside County Fire Chief John R. Hawkins recently received the Commission on Professional Credentialing (CPC) designation as Chief Fire Officer. Chief Hawkins is one of only 865 CFOs throughout the world. The CPC is an esteemed panel of professionals from local and federal government, as well as fire and emergency medical service experts that administer the CFO Designation Program. Criteria for receiving this prestigious recognition is a rigorous process which includes a thorough assessment of the applicant¿s education, experience, professional development, technical competencies, professional and industry-specific contributions, community involvement and finally, a future professional development plan. Serving as the CAL FIRE/Riverside County Fire Chief since 2006 only scratches the surface of Hawkins vast 50-year career in the fire service with CAL FIRE. Hawkins oversees what he has coined as an - integrated, cooperative, regional fire protection - system, inclusive of 97 fire stations, three inmate firefighter camps, one air attack base and nearly 1,600 career personnel. Hawkins also serves as the County Operational Area Fire and Rescue Mutual Aid Coordinator as well as the President of the Riverside County Fire Chiefs Association. Chief Hawkins extensive emergency management, firefighting, administrative and operational expertise continues; he is one of only 24 certified California Fire Chiefs and a certified Chief Fire Officer and graduate of the National Fire Academy Executive Fire Officer Program. I am very honored to be recognized by the Center for Public Safety Excellence. Throughout my career, I always tried to improve my education, experience and training. I strongly believe in making a difference-, said Hawkins. John Hawkins comes from a family of firefighters, including his three sons. He strives to promote and uphold his core values of leadership, competency, integrity, safety and customer service; and expects the same of each and every firefighter and support personnel.